The following day is boiling hot. Benvolio tells Mercutio they should get off the streets: the hot weather is bound to cause hot tempers. Just then, Tybalt enters with some other Capulets. Tybalt and Mercutio quickly start insulting each other and seem close to drawing swords. Benvolio tries to calm them. 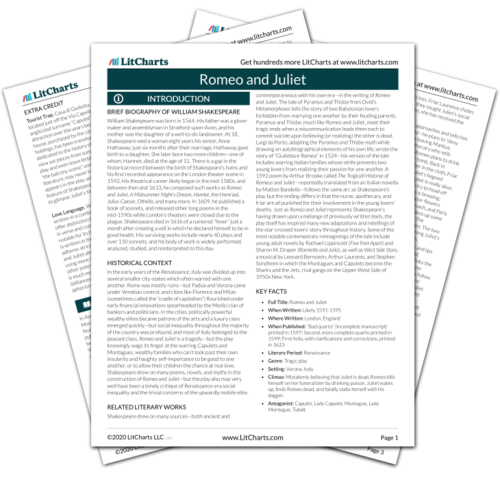 Scene shifts from the privacy of Friar Laurence's cell where Romeo and Juliet were married to a public square where friends, honor, and family ties hold sway. Romeo appears. Tybalt calls Romeo a "villain," but Romeo refuses to duel, saying that he loves Tybalt, and that the name Capulet is as dear as his own. Mercutio, furious that Romeo refuses to stand up for himself, challenges Tybalt. They draw their swords and begin to fight. Romeo steps between them to stop the fighting, but Tybalt stabs Mercutio under Romeo's arm. Tybalt and the Capulets rush off. Mercutio dies, cursing both Montagues and Capulets: "A plague o' both your houses" (3.1.86). ...but Romeo's love becomes warped by the social world, and results in the death of his friend. Mercutio's dying curse on the Capulets and Montagues can be seen as both foreshadowing and fate. Romeo says to himself that love for Juliet has made him "effeminate." Tybalt returns. Romeo avenges Mercutio by fighting and killing Tybalt. As the Watch and Prince Escalus approach, Romeo flees. Romeo realizes he can't live by love in the social world of men. He avenges Mercutio's death, as honor dictates he must. Benvolio tells Prince Escalus what happened. The Capulets demand that Romeo be executed, while the Montagues argue that Tybalt was to blame. Escalus banishes Romeo from Verona. The law, though neutral, does not consider private matters such as love, and so the law becomes R and J's enemy. Florman, Ben. "Romeo and Juliet Act 3, scene 1." LitCharts. LitCharts LLC, 22 Jul 2013. Web. 25 Apr 2019. Florman, Ben. "Romeo and Juliet Act 3, scene 1." LitCharts LLC, July 22, 2013. 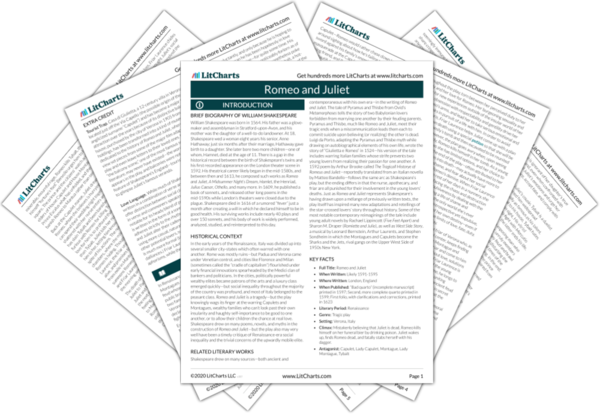 Retrieved April 25, 2019. https://www.litcharts.com/lit/romeo-and-juliet/act-3-scene-1.